Huawei may not be a household name, despite its partnership last year with Google to create the Google Nexus 6P with Android 6.0 Marshmallow. But this year, Huawei's flagship Mate 8 smartphone will be making waves in its own right. With strong efficiency, power and battery life, this smartphone is designed to satisfy anyone who relies on their Android phones for productivity and on-the-go tasks. The first noticeable thing about the Mate 8 is the visually pleasing display on its 6-inch, 1080p Full HD IPS LCD screen. While its pixel density of 367 ppi is not exactly bleeding edge, its wide viewing angles and color saturation provide a gratifying visual experience. The Mate 8 is reportedly the first phone to use an octa-core Kirin 950 chipset. This processor provides 100 percent more CPU performance power, 125 percent more GPU processing performance and 70 percent more power consumption efficiency than the earlier Kirin 925. Up to 4 gigabytes of RAM assist the chipset’s processing tasks. Choose between models featuring 32GB of memory (this model only has 3GB of RAM) for 599 euros or 64GB for 699 euros. Both variants have microSD card slots for storage expansion. The dual-SIM Mate 8 supports four 2G bands, nine 3G bands and 18 4G bands commonly used in 217 countries, so you can travel far and wide without worrying about being offline. With such a beastly chipset, you’d think this smartphone wouldn't last a full day. That worry is unfounded. A high-density 4,000-mAh battery sits underneath the Mate 8’s chassis, providing enough juice to last about 2.36 days on a single charge under moderate use and about 1.65 days under heavy use. When it’s time to replenish power, just half an hour of charging fills up the tank with enough juice to last a day, thanks to rapid charging technology. The Mate 8’s six-layer thermal mechanics enable it to dissipate heat quickly, resulting in lower power use and a phone that won’t scorch your hand. Both the Huawei-made Nexus 6P and the Mate 8 run on Android Marshmallow 6.0, the former using the vanilla version of Google Android and the latter heavily overlaid with user experience improvements via Huawei’s homegrown custom skin, Emotion UI 4.0 (EMUI 4.0). The customizations include tweaks designed to increase productivity, a split-screen mode for multitasking and an automatic defragmentation service that continuously optimizes the phone's operating system. The Mate 8’s next-generation circular fingerprint sensor scans your fingerprint better and faster than previous models. It adheres to Fast Identity Online (FIDO) and Android M standards, so you can make mobile payments more safely. In our testing, the fingerprint recognition was near instantaneous. The Mate 8 encrypts your storage to protect your data, and you can lock your microSD card so that no one can peep at your data without a password. The Mate 8's speedy main camera uses a Sony 16MP IMX298 sensor to focus on subjects quickly and capture images with high clarity and accurate color shading. The 8-megapixel secondary camera's beauty algorithm helps you snap the perfect selfie. With the Mate 8’s Super Hands-Free 3.0 feature, you can engage in clear, hands-free calls up to 3 meters from your phone. The handset can pick up audio within a 120-degree range and reduces directional nose so your conversations come out clear and crisp. It can record sound from all directions; when you play it back, you can choose the sound’s source direction. 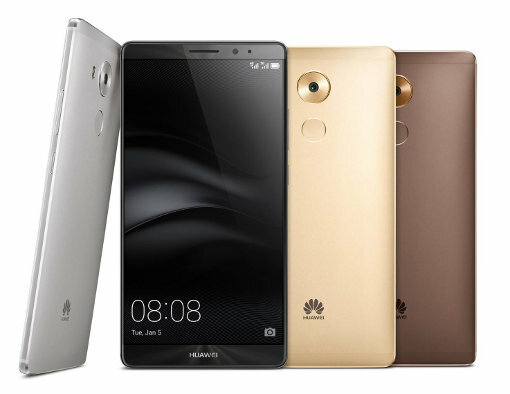 Huawei has not yet specified when or if the Huawei Mate 8 will hit store shelves in the U.S., although it will be initially released in 30 countries including Spain, Germany, France, United Arab Emirates, Mexico and Australia. The Mate 8 will cost 599 euros with 3GB of RAM and 32GB of internal storage and 699 euros for 4GB RAM and 64GB of storage. Four color variants will be available: champagne gold, moonlight silver, space gray and mocha brown.